Early in May, Gary Everest's wonderful portrait of yours truly (see my previous post here) arrived at my front door, hot from Oregon. 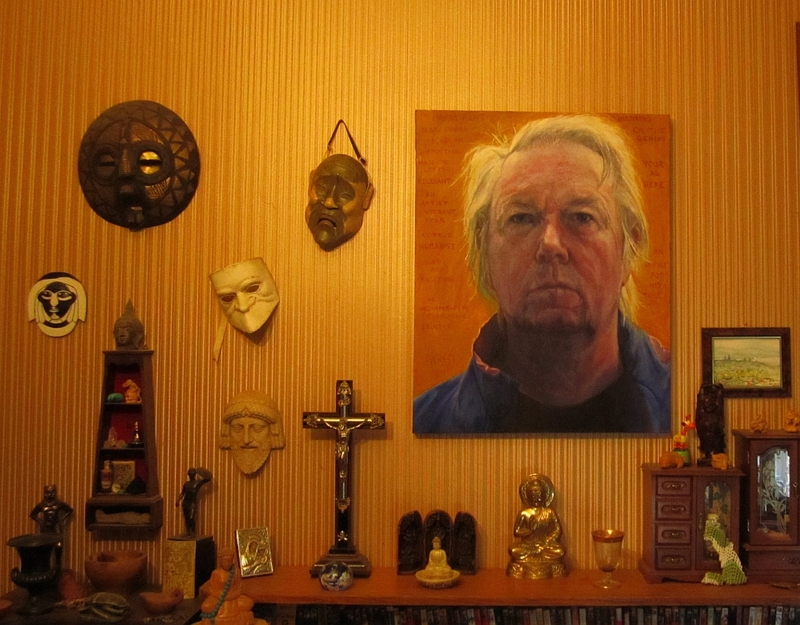 In the following days i re-arranged the paintings in my study to give Gary's painting pride of place behind my chair. I was reluctant to post a photo at first because my study is, well, a kind of an inner sanctum. Few people have ever been in here, or even seen in. But i am so thrilled with Gary's portrait of me that i will break a rule and post a pic of it here, among friends. I know you will keep our little secret. You can follow the evolution of the painting and some Gary's steps and adventures along the way here, here, here, and here. Or you visit Gary at his wonderful blog gleverestpaintings.blogspot.com and see other fantastic portraits he has painted. A warm, wonderful and modest artist. Thanks Gary. Your work gives me a lift every time i step into my study. It gives me food for thought - who i am, where i've come from, where i'm going. It gives me delight in the masterful paint-handling . And it warms the cockles of the heart that it was a generous gift from a distant but dear bloggy friend. i am speechless. great work. 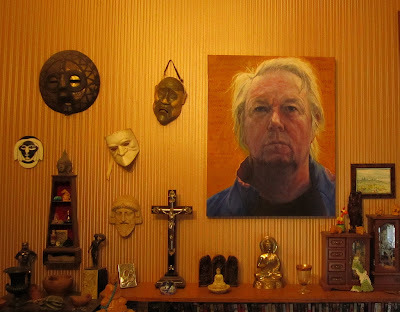 That is an amazing portrait of you Harry..I visited Gary's blog and was surprised that he and I are in the same town. See, I had to "go" to Tasmania to meet him. haha! (seriously, that's true! )....Thanks for sharing your den with us. I really LOVE that portrait of you! A beautiful portrait, indeed, and a lovely tribute to someone I know Gary admires very much; and I am honored to be able to enter a part of your sanctuary, Harry! :-) I followed the work in progress by Gary... a beautifull work, a great tribute to a great artit like you! A wonderful gift from artists to artist! The secret of your sanctuary will be safe here, Harry, it suits you well, many thanks for inviting us in! It looks great. When did the words appear? I don't remembber them and I thought I watched this being painting. Nice inner sanctum--looks like you're covering various religious bases. Thank you so much for inviting us into your studio. I can not imagine the joy and humility that you must feel by being honored with this gift from Gary Everest. It is a magnificent portrait by a spendid artist! Enjoying this generous exchange and painting progress via internet is an enriching experience for me. Many good wishes and thanks to you and Gary for sharing this with the world! Hi Leni. Yes, Gary is amazing. Celeste, so glad i could be a conduit, haha. Portland must be a pretty special place to be home to two such lovely people. But as they say, all roads lead to Tassie. Welcome to my sanctuary, Rhonda. Afraid it goes on and on like that round the walls, lol. And yes, i am deeply moved by Gary's tribute. He is a man of great soul. Hi Laura. Yes, i've seen your comments on Gary's blog. So glad we share this wonderful artist in common. Hi Gabriella. I knew i could i rely on your discretion. Is my snactuary an expresion of me? I suppose so. Or maybe it's just a narrative i've concocted to reassure myself that i'm not simply a psyche adrift on an ocean of Unknowing. Hi Hallie. Yes, those words. Such generous and good humoured words. Gary says they were a crazy last minute impulse. But they are one of things i treasure about this portrait. And it's one of things i delight in about Gary - that he gave a feral impulse its space. See how painting changes us by degress - painter, viewer ... and sitter? A mysterious activity, portrait painting. As for the religious iconography, yes, i've always been a seeker. Though Kabir saith, "I laugh when hear the fish in sea is thirsty". And i was a teacher of psychology, sociology, cultural anthropology - and sometimes of comparartive religious studies - for many years. The other wall has a bronze of the dance of Shiva and a glass painting of Michael slaying his daemon. We live in dread and hope. Yes, i am humbled by Gary's focused labour on my image. It is indeed an honour to have a person of such talent devote so much of his time, energy and attention on my sagging old visage, and inevitably contemplating what might live behind it. Love your delicate yet vibrant landscapes! nise, i knew i could count on your discretion too, haha. Our secret. Yes, i do feel most honored. And yes indeed - cheers to all of us!!! What a community of painters and friends! It's a marvelous portrait and looks as if it always belonged in its current place. Thank you for letting your blog-friends peek into your sanctum sanctorum. We are all 'psyches adrift on an ocean of Unknowing'. We each have to set our own anchors.